"One Harvard University chemist has developed an ultraportable “paper” chip that can diagnose killer diseases like malaria, HIV, hepatitis, and tuberculosis for just a penny at a time. 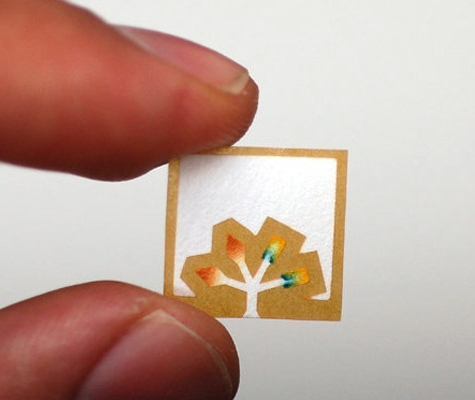 A finger prick’s worth of blood on one side of the paper, according to inventor George Whitesides, produces a colorful, tree-like pattern on the other that indicates what ails you. The surprisingly low-tech secret? Water-repellant comic-book ink. Saturated through several layers of paper, the ink conducts a patient’s blood into the forked channels, where it reacts with embedded chemicals to produce the bloom of diagnostic colors—not unlike a home pregnancy kit, Whiteside notes, except that the chips are smaller, cheaper, and test for multiple diseases simultaneously." Click here to see George Whitesides' TED Talk on the subject - it's really fascinating, and he is an excellent speaker!